Another of our favorite family fun activities is watching movies together. The kids love to pretend we have our very own movie theater. 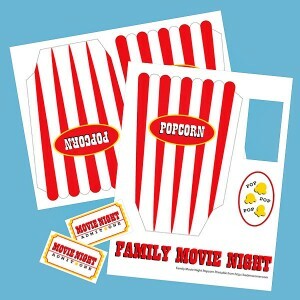 To make this even more fun I created these Family Movie Night printables complete with personal popcorn buckets, movie tickets and straw decorations. 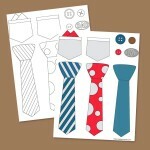 All you need to do is download and print the provided PDF. Then just cut everything out. A glue stick works perfect to glue the tabs on the popcorn bucket together. You can use a hole punch on both the top and the bottom of the popcorn straw decoration to create the holes for the straw to slide through. Just a note - by default this creates a three sided, triangular popcorn bucket. If you want a square bucket just print out and extra side and cut a square piece of paper to file the hole in the bottom.